way to spend an evening, Forever and ever, raining in my heart, somewhere over the rainbow, a medley by Neil Sedaker, A medley in the style of the Hammond organ. Lady and the tramp, welcome to my world, Dusty Springfield’s – downtown, Pachelbel’s canon, Strangers on the shore. The second half of the evening began with a march ‘the PHOS mach, composed by David. Followed by ain’t misbehaving, perhaps perhaps perhaps, Smile though your heart is breaking, the entertainer, A medley of dance music, hello dolly, The stripper, The hustle and the encore from High society. Dirk, as he suggested we call him, arrived… He had just made the journey from Holland to perform for us. His character like the instrument he brought with him was much larger than life. We had an evening of great entertainment with a wacky sense of humour made all the more amusing because of the constant distorted translation from Dutch to English. Dirk brought the audience into his performance and encouraged participation. We were rocking in our seats and some even found themselves jumping out of them at times or waving arms in the air to make the letters YMCA. The music we heard was a very accomplished performance and with the requested encore ran slightly overtime. Many rose to their feet at the end of the performance. Amongst the music we listened to were; Beautiful noise, Lugarno (A piece composed by Dirk whilst in Switzerland) Bizet Carmen, Standing by, Valerie, Spirit of Norway, Willie Nelsons, “On the road again”. A medley from Grease, A rock and roll selection, because we believe, A Latin American selection, the Snow Waltz, Tequila sunrise, that will be the day, YMCA, Tulips from Amsterdam. Bless Em All, Unforgettable, and A medley from Les Miserables. The encore was itself a medley of many other pieces. I AM CONTINUING TO PRODUCE THE NEWSLETTER BI’MONTHLY IN ORDER TO SAVE ON POSTAGE AND THIS ISSUE IS FOR JANUARY AND FEBRUARY. AS I SAID IN THE NOV/DEC 2016 NEWSLETTER THERE IS A POSSIBILITY THAT THE BOKC WILL CLOSE AFTER THE MARCH CONCERT THIS YEAR. THERE HAVE BEEN APPROACHES TO HELP THOSE ON THE COMMITTEE WHO WISH TO RETIRE AND THIS !S BEING INVESTIGATED. Our artiste for the evening is CHRIS JONES who played for us in January Last year when at the last minute he stood in for Nicholas Martin who was unable to get to us in time. Chris lives in Petts Wood, Orpington, Kent and this was a big help to Jean when she needed to get an alternative player who was not too far away. In fact he came to us straight from work. Now about Chris – his interest in music began with piano, which he studied from the age of 11, until at 13 he was introduced to the electronic organ. At the age of 14 he gave his first public performance playing at his local organ society in Orpington as well as at school both on organ and various musical productions. Upon leaving school Chris worked in an Estate Agency in retail, including an organ shop in Croydon. During this time he assisted as deputy organist at Streatham ice Rink, playing Hammond c3 for dancing etc. He also performed small concerts for dancing local to his home. In 1995 Chris met David Lingwood at the first Caister Keyboard Festival and he turned professional and ever since then he has played for organ societies all over Britain including the Channel Islands both solo and in duet with David. Also performing at most of the major Keyboard festivals as welt as writing for various Keyboard publications. 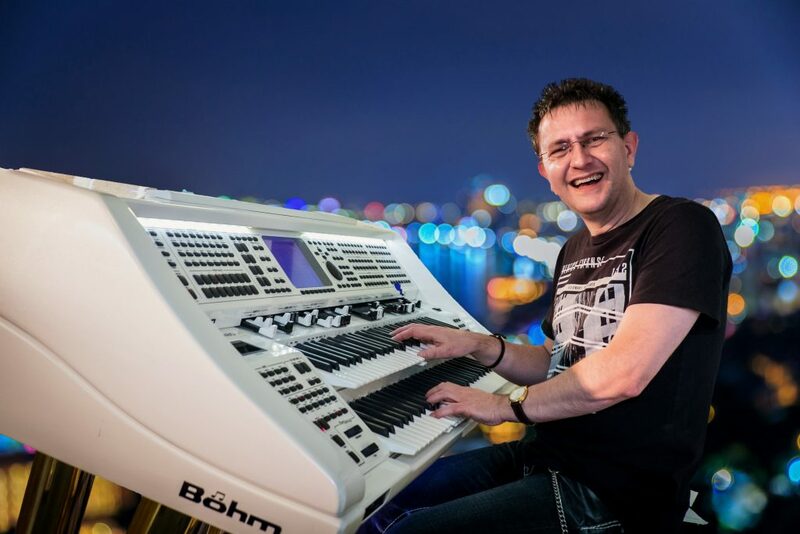 in 1991 Chris worked as showroom manager for Wersi at their headquarters in Purley, in 1994 for GIG sounds in Streatham, south London and in 1995 Rose-Morris in the west End in 1996 Chris was offered a job as manager at Roland Friday Keyboards, Bromley. They later sold the retail business to Music Land. Chris’s musical tastes cover a broad spectrum although he says he is particularly keen on Musicals, Marches, Romantic Ballads, and Latin American and he likes to include music from the shows in his programme. On his last visit to the BOKC Chris played a selection of music for everyone and it was an enjoyable evening. Looking forward to seeing you on MONDAY 23rd JANUARY with CHRIS JONES.